Pruning pomegranate trees is the way by which you can turn a pomegranate bush into more of a tree. There are two reasons you would want to prune a pomegranate bush or tree. The methods for pruning pomegranate trees are also different, so you must decide first your reason for pruning and then begin the process accordingly. Some people grow pomegranates for their fruit and others grow the plants strictly for decorative or ornamental purposes. What if you would like to have both benefits? The answer is that you must decide on which is more important to you – the fruit or the decoration. Pomegranate plants left to grow, as they like will be a short, sprawling bush. They naturally produce suckers in the root and crown area of the plant. For those who want a tree-like pomegranate plant rather than a bush, you must choose one main trunk and then regularly remove the suckers that appear. Once the trunk reaches roughly 10 inches above the soil level, choose roughly 3-5 branches that will grow out from the main trunk. You’ll want to continue pruning these branches as they grow so that the tree can focus its energy on these branches and not the little suckers that will continue to appear. As the tree grows, you must prune it in such a way that will encourage the growth upward rather than outward. A pomegranate tree has a beautiful, natural arching form that reminds you of a vase-like shape. You don’t want to prune the branches short because it will ruin the appearance of the tree. Instead, thin out the branches in the center of the tree and remove the small stems that appear to be growing too close to the main branches. This way you’ll retain the overall beauty of the tree while encouraging it to grow as a tree rather than a bush. If your goal is to have lots of juicy fruit by the time fall arrives, your pruning methods will be slightly different than those who simply desire a pretty tree. You must encourage new growth during the spring by shortening the main branches of the tree. Fruit will appear at the tips of the newest branches, so by keeping them short, you’ll encourage more fruit development. You’ll want to prune the branches of a fruit-bearing tree for the first three years. You can also lower the height of the tree by pruning which means you’ll have more concentrated fruit blooms and as a result, more fruit at the time of harvest. Regardless of the reason for which you are pruning pomegranate trees, dead branches and stems should be removed if they appear. Some say pruning should take place in the spring and others say the fall. Still other pomegranate gardeners say that there is reason to prune during both of those times of year to get the best results. 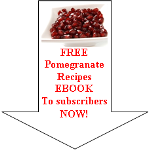 Read enough about pruning pomegranate trees and want to discover more about the pomegranate tree?